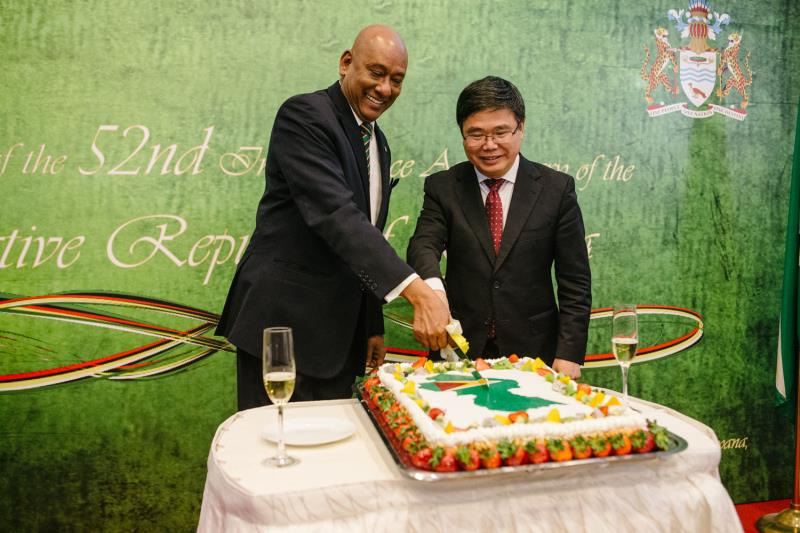 The reception to celebrate the 52nd independence anniversary of the Cooperative Republic of Guyana was held at its embassy in Beijing on May 29, 2018. 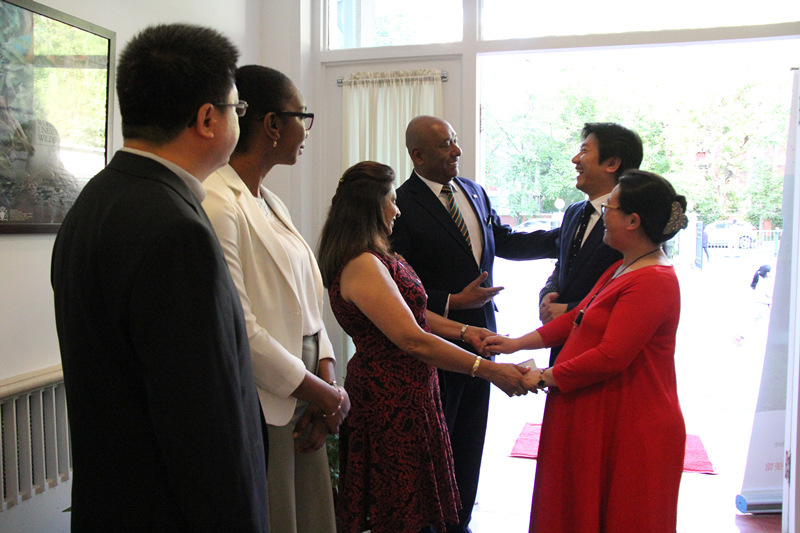 Ambassador of Guyana, Mr. Bayney Karran, representatives of the Chinese government and other embassies along with the guests from companies and organizations had all attended the ceremony. "Guyana" is a word, which means "Land of Many Waters." The country is so named due to its numerous rivers, creeks and waterfalls. The first Europeans to settle were the Dutch who traded with Native Indians and began cultivating cotton and sugar cane in the 17th Century. For more than 100 years Guyana was colonized by Holland, France and England as they competed for ownership of Guyana and other territories in the region. Eventually, Great Britain had gained overall control in 1814 and named the territory British Guiana. It remained a colony until achieving its independence in 1966. The country's name was then changed to Guyana. In 1970, Guyana became a Republic, officially named the Cooperative Republic of Guyana. It is the only English speaking country among the twelve countries of South America. Guyana cherishes the heritage of its people including its Chinese immigrants. Chinese laborers emigrated to Guyana beginning in 1853. They soon became an important segment of local society and many of them had risen to prominence in Guyana as professionals in law, medicine, sports and other fields. January 12th each year is celebrated as Chinese Arrival Day. The first President of Guyana, who was appointed in 1970, was Arthur Chung, a Guyanese-born Chinese. He became the first ethnic Chinese Head of State of a non-Asian country. 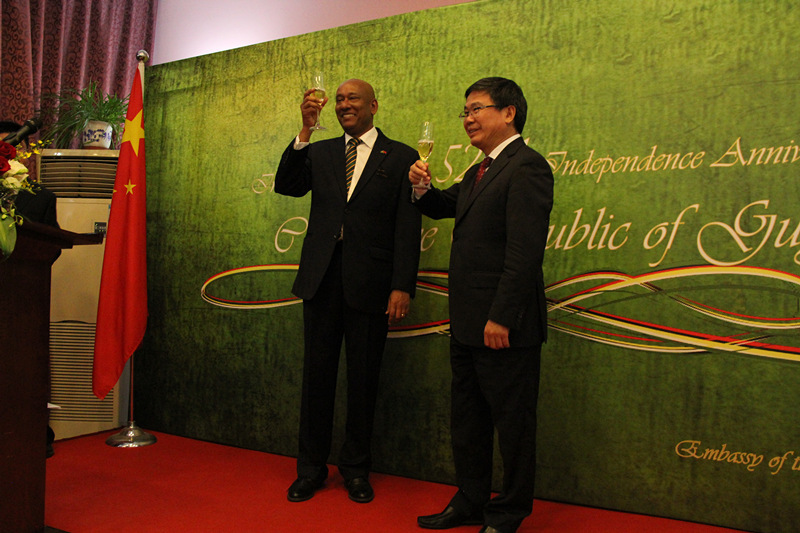 Guyana opened diplomatic relations with the People's Republic of China on June 27, 1972, an act, which was soon followed up by opening the Guyana embassy in Beijing on October 1973. China and Guyana have supported each other's positions on crucial international issues, such as south-south cooperation, regional integration and China-Caribbean cooperation. Guyana's economic fundamentals are strong. Its currency and macroeconomic indicators have been stable for more than 25 years. Since 1990, economic growth has steadily averaged about 4% per annum. The debt, fiscal and external balances are within sustainable levels. Growth in 2018 is expected to exceed 3 percent. With the recent discovery of huge oil reserves and greater government support for renewable energies, more natural resources are pouring into the country's service. Exportation of oil will begin in 2020. The rapidly evolving energy sector adds a new dimension to Guyana's economy. The Government of Guyana's preparations for future hydrocarbon production could ensure sustainable long term growth. 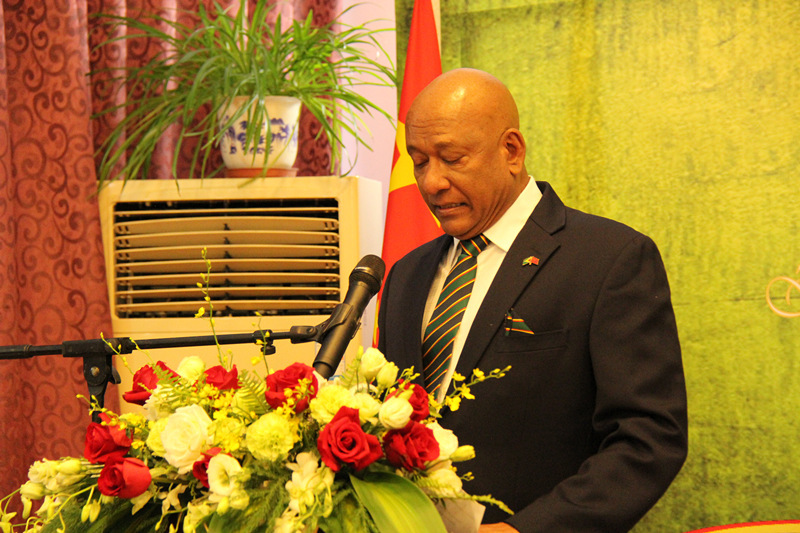 Guyana has a Most Favoured Nation trade agreement with China and enjoys significant Chinese investments in major industries including the forestry and mining sectors, construction, restaurants, hardware and clothing. A recently discovered offshore oil bonanza vastly expands the possibilities for economic growth and development of bilateral cooperation with China. Bilateral trade volume has risen 200 fold from US$1 million to US$0.2 billion in the past 45 years. Just as Ambassador Mr. Bayney Karran said, "Guyana and China have been willing and dependable allies on the consistent and mutual bases, this partnership can be further cemented while simultaneously securing Guyana's future development. China is welcomed to participate in new projects in developing Guyana's agriculture, minerals, forestry, energy, infrastructure, technology and tourism."